In normal life I’d probably agree with this statement. There’s something so wonderfully gratifying about escaping the world and just catching up with yourself. Working through a personal to do list, sorting your sock drawer, reading a book, taking a trip to a spa, whatever takes your fancy. Modern life doesn’t afford us much time to ourselves. Work, public transport, mobile phones and social media can make it feel like we’re always in company, like it or not. So it’s only when we really switch off from human contact that we can truly measure our feelings towards being alone. Some of us relish in it, talking to ourselves as a means of guaranteeing intelligent conversation. My wife called this ‘Mum’. Some of us indulge in it, taking time to pamper and prune. My wife called this ‘beauty school’. Some of us need in it, using the time out to reflect and absorb some much needed calm through relaxation or meditation. My wife called this ‘just piss off for a bit, I never get any time to myself’. But many of us really fear it. If you stopped ten people in the street and asked them each how they would ‘like’ to die there would probably be a pretty even split of ‘happy’, ‘peacefully’ and ‘in my sleep’. You’d be hard pushed, however, to find someone who said ‘alone’. I find the concept of loneliness in a connected society somewhat paradoxical. If you want a conversation with someone to break the cycle of solitude you can simply go online and find a friend who feels the same way. You can see when they are there and whether they are up for a chat, et voilà, a virtual chinwag. But then not being alone, either physically or virtually, is not necessarily a remedy for loneliness. I rarely get chance to be alone at the moment because so much contact, affection and goodwill continue to pour in to both me and my son. I have him by my side too and he is like my little joey right now (a baby kangaroo, not Essex). I’m not alone but I am lonely. 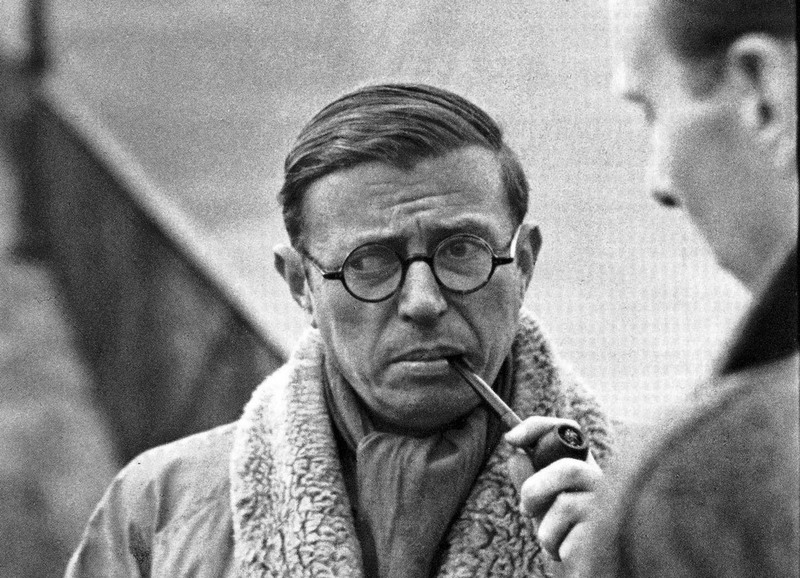 So I think Jean-Paul Sartre had a point in normal life but perhaps not in grief life. In not considering loneliness caused by grief, he missed a subtlety that people surviving the loss of a loved one will understand. So I’m owning this quote, J-P! I’m lonely because I know what I had. If I were sat at home alone on a big sofa on a Saturday night watching a film that wasn’t really holding my attention, I wouldn’t feel lonely knowing my wife was in the next room, at a friend’s house in the next street or even in a hotel room on the next continent. I’m lonely not because I’m at a loss for someone to converse with but because I’ve lost the person I really really want to talk to. So there’s lonely and there’s lonely, but then I keep finding that the most important words in the English language carry too much weight and significance to be captured so one-dimensionally in a single collection of vowels and consonants . God knows if Inuits really do have dozens of words for what we call ‘snow’, but if they do, how strange that ‘love’ and ‘loneliness’ are used so broadly and have so few variations. Perhaps what I feel (what we feel in this situation) is best described as ‘solitary’. That’s still not it though so, once again, I find my first language inadequate in explaining the pain and isolation of loss. …it’s having no-one to sit in companionable silence with (quote:- me) or having no-one to do nothing with (Esther Rantzen). I used to say I felt alone not lonely but loneliness now creeps in as I hurtle towards four years. Hi Ben, Been reading your comments on facebook since day dot. It does kind of give people an little insight not only into your personality but the dynamics of the life and relationship you had with your beautiful wife. Taking a step away from yourself and looking into that relationship, do you think, or have you read, if , depending on those dynamics, people grieve in different ways to each other that throw the general “rules” of grieving out the window? Not the ” you need time, you need to do this, that or the other” but that certain advice should simply not apply to you? Whether you are the giver or the taker in a relationship must make a huge difference. If you were the one organizing, looking out for, doing things for, or the other way around; the entertainer, the funny one, the partner who would never pick up or tidy behind themselves, however simple or huge these acts were, there is usually one of each personality, a balance in a relationship. Those things that most people say annoy the cr*p out of you, but you would miss so much ! lol. You wanted people to think about and understand your loss and what you are going through and in reading what you have written so far, it has made me think….the inability of words and language to explain things… the way you interpret something that is said to you or that you read….each person seeing these things differently from you, each person coping in a different way. In recognising which “role” you played in your relationship, perhaps there are ways that help you more but simply cannot not help others as their general personality makeup does not make sense of the advice. Having said this, I know the grief of death is paralyzing and I am not trying to compartmentalize it. I am so not any kind of expert in this subject at all but you have made me think. I have not come across anyone writing on this aspect of grief. Grief is huge, grief is a giant but ,like coping with life, you have strategies and things you say and do to help you along. Things that other people would never do. Each persons sense of loss is different, a million things. This chain of thought came directly from reading what you wrote, I wanted to know what you thought about it, if anything. Forgive me if I intrude too much, it was not my intention. Like so many others, I don’t know you but I have been reading your blog for a long time. Anyway, the lack of an appropriate word for these feelings makes me think of a word in my native language that does not exist in English, and I find this word so important for communication that I don’t know how so many other languages don’t have an equivalent one. This word is saudade. All the best for you and your boy. Thanks so much for this. It’s wonderful to discover that the language is out there, even if it’s in another tongue. Really interesting and emotive, thought provoking piece, I’ll be mulling it over for some time to come. Loneliness is definitely more prevalent in today’s nomadic and insular society. Grief heightens this, no doubt. I recommend a fascinating Charlie Brooker TV satire (but not if you are easily offended) that covers social dislocation in the age of social networking and offers a weird and wonderful glimpse into the not too distant future, where technological advances could alleviate / exacerbate spousal grief (delete as applicable). I watched it a few weeks after my 2yo daughter died, it didn’t offend me, I found the concepts explored intriguing. The portrayal of grief didn’t even touch the sides, but then if any art form did, it would surely be too harrowing to consume. Thank you so so very much.Am a widow now six years.I thought i can be a lone but now am so lonely to death.Am 48 years old looking for a man who is 60yrs and above.I want a man who will be there for me.Love me and care for me.I have four adult children all on their own.I really down. Can i meet a man good in this site.I do pray i meet one soon. I’ve been a widower for 3 years I know how you feel be Strong. This interesting.i never knew you people mind us.thank you. Hi, I’m now well in to month 8 after my wife Victoria passed away on holiday. I now find myself trying to learn to be on my own. Friends and family have come and gone, carrying on with their own lives. Which I do understand but once my 9 year old daughter is tucked up in bed my life then stops. I’m trying to restart my now new life with what I think is correct. I’m 36, just decided to leave my job after 18 years and start studying. Loneliness – I need to figure it out. Just reading your article as Im tucked up in bed.ive been a widower for seven years now and I can so relate to what you write. I was married for 15 years and not a day goes by when I don’t find myself talking out loud to her picture hanging on the wall,I’m not on face book or Twitter and I’ve never ever replied to an article I’ve read, but on this occasion il make an exception.like Bob said,I also know how you feel. I am 71. My partner died last year. I completely understand what you are saying. Within a true relationship there are boundaries that tell you where you are, they place you in the world and define your sense of completeness. When your partner dies, there is this awful blank space where you exist as only part of the whole. It is not loneliness. It is aloneness. it’s the sudden appearance of nothing as as a place to live where once there was home. And you can’t do a thing. This entry was posted on April 4, 2013 by Ben Brooks-Dutton and tagged company, Desreen Brooks, fear, grief, Jean-Paul Sartre, joey, Joey Essex, language, life as a widower, loneliness, lonely, loss, male grief, quote, solitary, solitude, widower, wife.